Sometimes I still print stuff off the web, crazy huh? When I do it, I may not necessarily want everything on the web page to print. I don’t want to print advertisements, social network buttons, certain text or graphics, etc. 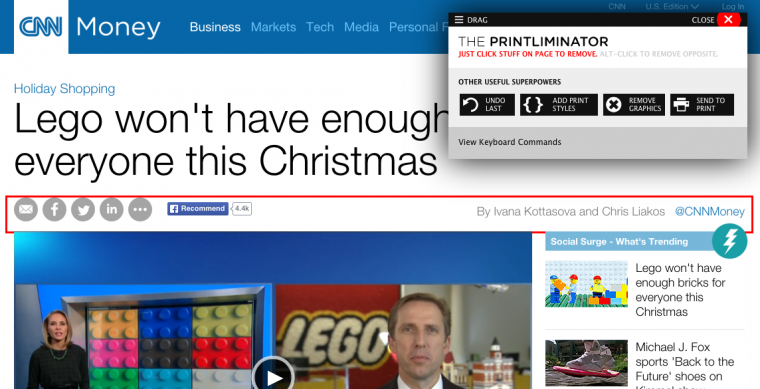 With The Printliminator, you can selectively remove parts of a web page before you print. It saves paper and creates a nice and neat printed sheet with only the content that you want. The Printliminator is a bookmarklet. A bookmarklet is just a regular web browser bookmark, but it runs code on the current web page you are viewing instead of linking to another site. When you want to print something and remove elements from a page before printing, you click the bookmarklet and a little box of tools pops up in the top right corner of your screen. Now you can just click on parts of the web page and remove elements. After you are done, you click Send To Print and your nice clean page is printed. Here is a video walking through the installation and use. Having a team that is spread across two bordering states (let alone across the country or World) can be challenging. Sharing files and collaborating can become a challenging proposition. Emailing files back and forth can become confusing and detrimental to getting work done. Luckily there are great solutions to closing the distance gap between teams and allowing them to share and work on documents together and avoid these problems. Westwords initially relied on emailing files back and forth or dropping them on FTP servers while working on a project. Then Google Drive came out and allowed us to essentially have a file server in the cloud. We can easily sync and share files between our computers, phones and web. Our email inboxes are free from large files and confusing versions of documents. We can simply toss our files in a folder on our computers and they sync up to the Google Drive servers. The document collaboration features also allow us to work through a document just like we are in the same room. You can access Google Drive from the web, upload your files and create/edit documents right there in your web browser just like you would with Word or Excel. If you install the Google Drive application to your computer, you can keep all or some of your documents synced. Documents created on the Google Drive website will be saved to your computer as a shortcut that will open the document on the web. Another option is to use Insync instead of the official Google Drive app. Insync will sync all of your files from Google Drive, but it has the ability to convert your Google Drive documents to Microsoft Office versions. So your Google Drive Document would be a Microsoft Word and so forth. Any changes you save will automatically be synced to Google Drive. 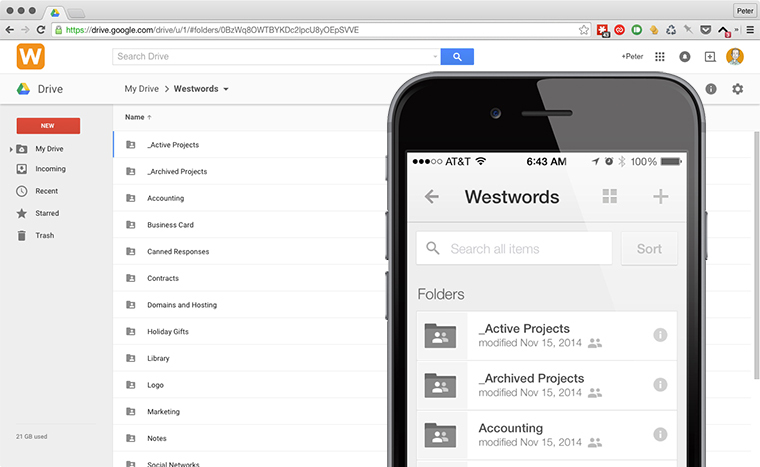 Google Drive can also be accessed from your smartphone or tablet by installing the app. This allows you to browse your entire Google Drive storage and edit documents just as you would on your computer. To learn more about Google Drive, Bradley Chambers has created an excellent screencast series called Learning to Love Google Drive. He walks you through an introduction of Google Drive and all of the basics to get you started storing your documents in the cloud and collaborating with your team on the web. Google Drive is included with a free Google account, however there are many paid storage plans you can upgrade to. OneDrive (formally SkyDrive) can be used to store documents and files in the cloud and easily keep them synced between PCs and Macs, similar to Google Drive and Dropbox. You can then also access your files from the web or their mobile app. 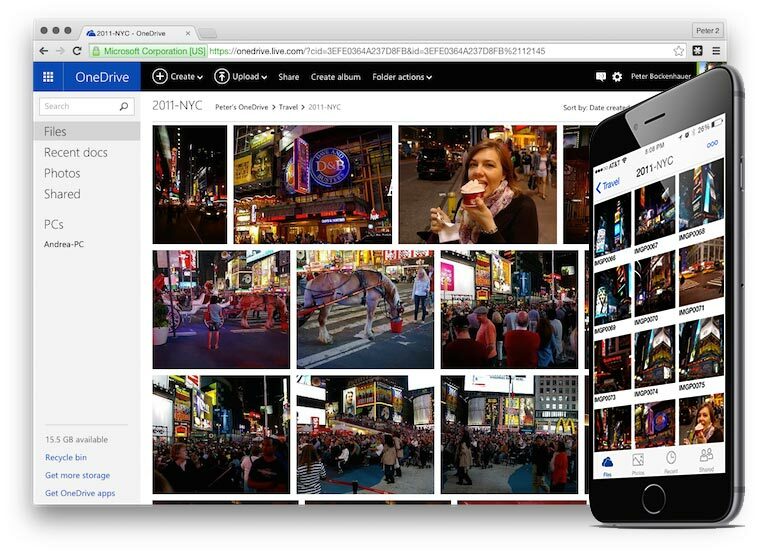 Microsoft recently announced some changes that make managing photos with OneDrive even better. I’ve used OneDrive primarily to store all of my photos for the last year. I’ve tested many other cloud storage services for managing my photos. OneDrive is my favorite and I find is the best for storing and viewing my photos. The web interface is fast and easy to manage and flip through your photos and I have found that their mobile app is the best catered for photo management. You can also share out folders with others and any new photos you add to the folder will be updated on their end. I keep all of my photos in folders organized into categories and sub-categories on my Mac instead of using a photo management app like iPhoto. Being able to simply sync these folders with the OneDrive service and then access them on my iPhone works great. It also makes syncing all my photos with my wife’s PC easy as well. OneDrive is free for up to 15 GB and plans start at $1.99/month for 100 GB. I come across many links every day either on my computer or my phone that I may not have time to read just then, but I want to save for later. Instead of bookmarking them or leaving the browser tab open, there is a better way. 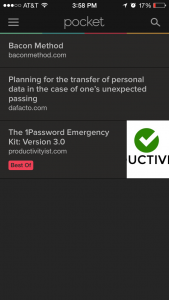 Pocket is a great service to help you save these links to come back to later. Pocket is a service you can save links to and read on their website, iPhone app/Android app, or Mac app. The best part is that it is integrated in several smart phone apps as well. So if you come across a link, you can save it right there and come back to it in Pocket. With iOS on the iPhone/iPad in particular, there is a share option that can be used in almost any app. Here are instructions for enabling that after you have the app installed. I use the official Save to Pocket Chrome extension that adds a button to your browser’s toolbar. I also use the PickPocket Chrome extension that adds a little drop down menu to your toolbar for quick access to your Pocket queue.